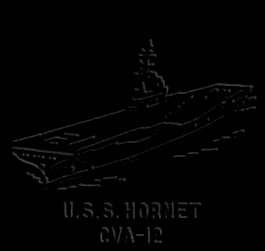 HORNET was the first fleet carrier to be painted with the "Dazzle" Measure 33/Design 3A paint scheme as commissioned, and was one of the last ships to have her pattern painted out, when she was repainted with Measure 22 in July 1945. Dull black numerals with yellow dashes were painted on her flight deck. The thin dash line that was centered on the forward elevator was normally centered on the ship's center line. "Light Pattern System" with an overall reflectance of about 40-50%. The light colors Pale Gray (5-P), Haze Gray (5-H), and Navy Blue (5-N). Because of the high visibility to high aircraft observation, this measure was abandoned in 1945. This measure was open, and did not specify any colors, only shapes. This measure was also used on INTREPID, HANCOCK and on the port side of FRANKLIN. Navy Blue (5-N) was used on all vertical lines from the hanger deck to the boot topping. Haze Gray (5-H) was used on the rest of the ship.